Shortly after World War II, Bill Monroe added a 5-string banjo player named Earl Scruggs to his band. Scruggs' revolutionary melodic fingerpicking style of playing the banjo, together with Monroe's mandolin playing, high-tenor lead singing, and his close-harmony vocal arrangements, created the distinctive sound that came to be called bluegrass music. 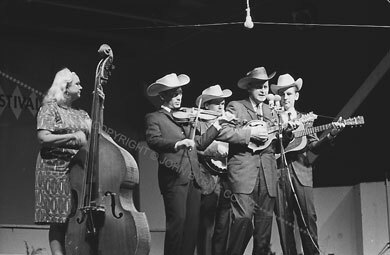 In the early 1960s, it was Earl Scruggs, together with Lester Flatt, another alumnus of Monroe's group, who introduced bluegrass to folk audiences in the northeast. It seemed the folk revival might pass the founder by, until Ralph Rinzler brought Bill Monroe and the Blue Grass Boys to the 1963 Newport Folk Festival.